With only a few days left before UK Games Expo, Just Crunch Games brings you savings on my back stock of supplements and adventures – so you can get some of the Expo experience without needing to get on a train, plane or into an automobile. We will have copies of all these adventures and supplements on the stand in the NEC hall, but for many the trip will be a little too far – so I’m offering all of them at 30% off for the next week (until I’ve turned drained but hopefully happy from the far shores of south-east Birmingham). What is it this sale offers and why should you pick it up? The Consult Appendix Z duo offer quick, roll-and-play hooks for a session of play. So, Another Bug Hunt gives you a versus the alien menace style game with a few dice throws. Mix in some other story generating mechanism, like Rory’s Story Cubes, and you can improv every aspect of an adventure. There’s this old cruise ship owned by a heritage preservation group. Heck, maybe the Cameron Maritime Foundation raised the Titanic. The Foundation was set up 74 years ago and has spent much of that time raising the money, completing the mechanical process of getting the whole ship to the surface and then rendering it fit for access (although some papers suggest its all a bit of a tax dodge). Alas, the Krilx got there first, a species from the deep sea vents evolved over millions of years and intent upon protecting the ship which holds the creatures egg clutch in the furnace. The characters have to get on and execute the Krilx with extreme prejudice – but the unit is not without its own dark secrets and sub-missions… someone needs to see this task completed without any record of events. While the outer skeleton maintains the structure and function of their organs closer to the surface, the Krilx take on a sickly gray, leprous look – the result of bacteria from deep-sea vents mutating in the oxygen-rich atmosphere. The bacteria causes rapid damage and major organ failure from any wounds inflicted by the creatures. The Krilx ooze an inky, sticky venom that they use to create traps for food. 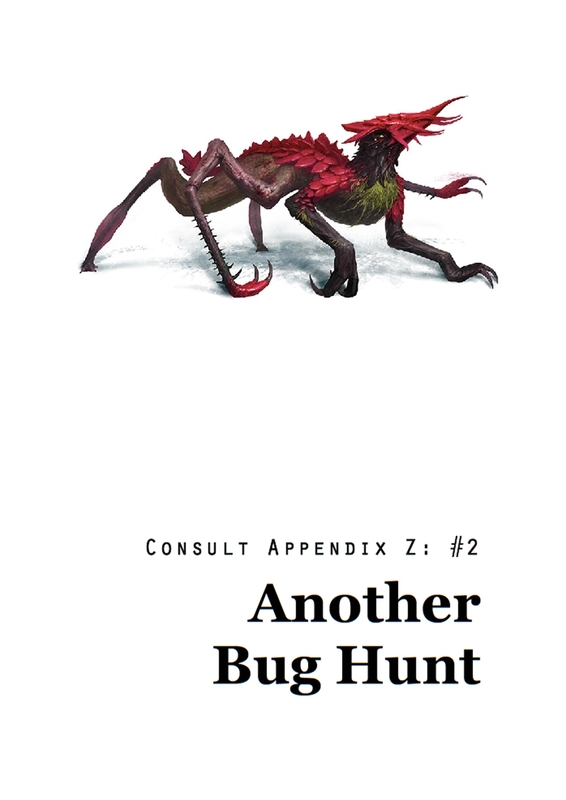 The idea of both Consult Appendix Z supplements – Another Bug Hunt and Interstellar Travel Events – is to create a set up for a quick game with a minimum of effort. No specific system intended – nor would you necessarily need one if you just want to play it out as a shared narrative. The Blessing is a generic mystery adventure, originally written for a fantasy game – however, I have successfully run it before tweaked for a more modern setting. The characters have been approached by a local trader as his only daughter has vanished and he can’t account for her whereabouts. He fears she has either run off with a suitor or something worse. The investigation takes the characters to a local manor house and into the woods beyond the village where lies the crumbling Chapel of St Agnes. Right now, this is written without a system and I sell physical copies at conventions with extra handouts included. 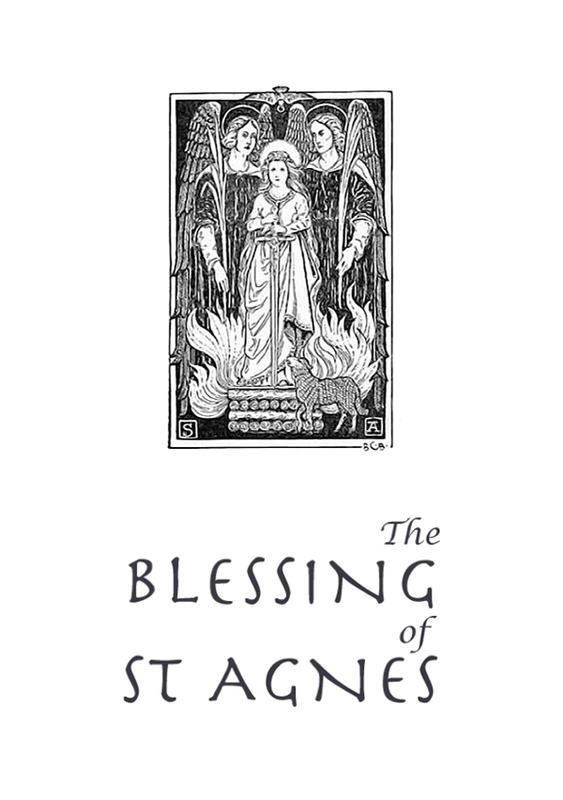 As it has been some years since last I gave The Blessing of St Agnes a revision, so I’m thinking it might be time. With that in mind, I have plans to rework it as an adventure for The Cthulhu Hack – but equally usable with The Black Hack. The out-of-the-way village faced with tragedy fits both a fantasy game and a mystery in the 1920s. If you pick up the PDF in the sale now, you’ll automatically get the updated version when I’ve completed the revision of the file. A much bigger set up in a sort of mini-sandbox, the ‘modventure’ Stench of the Sea provides the elements of a module and an adventure rolled into one. I wanted to experiment with something a bit bigger than a one-off quest by adding in content like non-player character cards, a local fort, a random mine generation system and a really stripped down game engine to handle mechanics. The adventure setting includes images from Graham Bottley of Arion Games and a map from Tony Dowler. On top of that, I turn my artistic hand to creating a few maps and character portraits myself – as well as the tunnel behind the troglodyte on the front cover! It’s possible – just possible – that I will also update this to an OSR system of some kind – whether the Hack or something similar. We’ll see what time allows. Whatever happens, if you buy it at the sale price, you get all future updates and tweaks for nothing. The sale runs across RPGNow and DriveThru from now until the 5th June.